Join your friends on Saturday, September 5th, 2015 for RockFest at Emerald Village, just off the Blue Ridge Parkway near Little Switzerland. Celebrate the gem mining heritage of the mountains in a spectacular setting at the home of 12 historic mines. 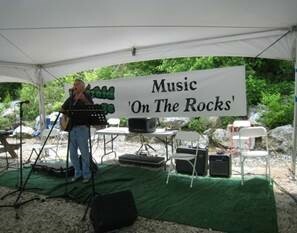 Enjoy free live music under the tent from 11 to 4, with some of the best mountain music in the area, including Pete & Kim McWhirter, Glen Nance & Lennie Ski, Paul Thomas, and Alan Tinney & Kirk Banner. Enjoy great food catered by the Switzerland Cafe or pack a picnic and enjoy our spacious picnic areas while listening to the music. 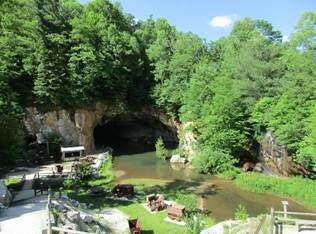 Take a free guided hike to a hidden mine at 11:30 or 3:30. Children (12 and under) will enjoy the free Kid's Treasure Hunt all day. There will be a special Geology Mine talk and walk at 10:30 by Alex Glover, renowned professional geologist. A special treat will be the demonstrations of rappelling from the mine cliffs by daring members of area rescue squads. You’ll have an opportunity to watch them up close! All day long you’ll be able to experience underground mine tours, gem mining at the flume, gold panning, and rare mineral collecting on the dumps. Browse through the free Discovery Mill exhibits. Activities will run from 9:00 AM till 6:00 PM. After a day of fun enjoy a fine dinner at one of the local restaurants. Then come back at 8:30 PM for a one-of-a-kind underground Black Light Mine Tour ($15 Adults/$10 Students). RockFest is a great way to celebrate the end of summer in the heart of the mountains!